Illinois outfielder Carly Thomas (25) hits a home run during the game against Northwestern at Eichelberger Field on Wednesday, Mar. 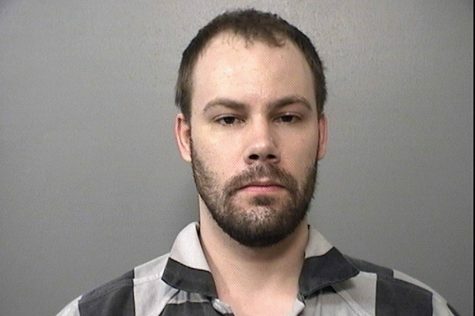 28, 2018. 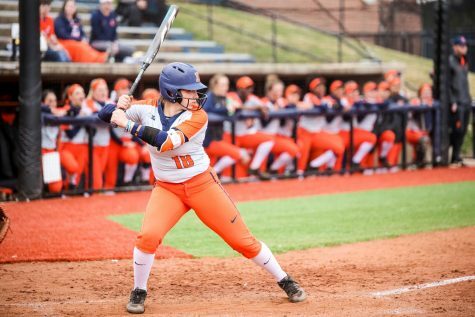 Illinois softball finally returned to Champaign on Tuesday for its home opener after playing 21 games on the road. In the first six games of the seven-game homestand, Illinois went 4-2, dropping games to Indiana State and Wisconsin. 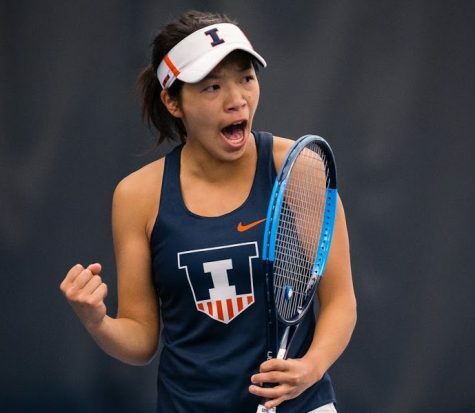 Illinois opened up its home stretch against non-conference opponents Indiana University-Purdue University Indianapolis and Indiana State. 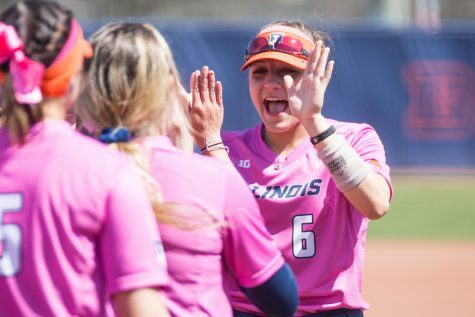 Heading into play at Eichelberger Field, Illinois was clinging onto a 16-5 record, the team’s best start since 2010 when the Illini started off 21-2. The Illini were coming off a 4-1 performance in Los Angeles at the Loyola Marymount University tournament, and their only loss was to the No. 2 Oklahoma Sooners. 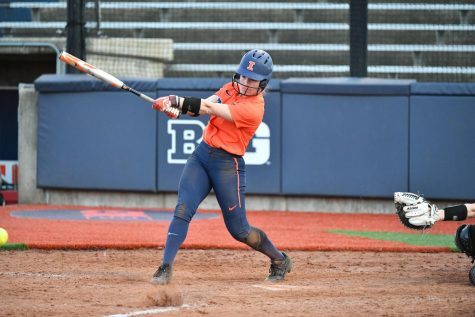 The Illini secured their 15th home-opener win at Eichelberger Field after they clinched a 9-4 victory over the Jaguars who entered the game with a 6-20 record. Redshirt senior Carly Thomas and sophomore Bella Loya led the Illini at the plate, both posting 3-for-4 performances and a double apiece. Thomas and Loya also led in RBI’s with three and two, respectively. Loya added two runs. In her final home opener, senior Emily Oestreich started things off strong in the circle, shutting out the Jaguars through the first three innings. But IUPUI’s offense attacked first in the top of the fourth inning, earning one run off Oestreich. After three scoreless innings of their own, the Illini wasted no time getting back at the Jaguars scoring five runs in the bottom of the fourth inning. Thomas led the inning with a three-RBI double. Oestrich gave up two earned runs in the fifth inning before being replaced by junior Akilah Mouzon. The Jaguars earned one run off Mouzon in the fifth before the junior pitched six-straight outs to earn the save, giving Oestreich the win. The Illini grabbed a run in the fifth followed by three runs in the sixth to secure the first win of the week. 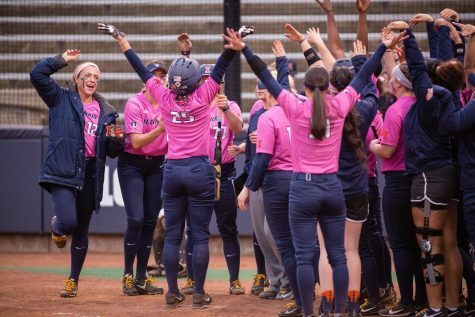 Illinois got less than 24 hours of rest before heading into a doubleheader against Indiana State on Wednesday. The Sycamores were hot from the start in the first contest, scoring three runs off two doubles in the first inning. Senior Alexis Carrillo got things started for the Illini in the second inning with an RBI double. Illinois notched another run in the third inning off a bases-loaded walk. From the fourth inning on, the game was all Indiana State. The Sycamores scored lone runs in the fourth and sixth inning but had their biggest showing in the fifth with four runs that secured the 9-2 win. Senior Taylor Edwards took the loss after pitching four and two-thirds innings while giving up 11 hits and eight runs, three unearned. 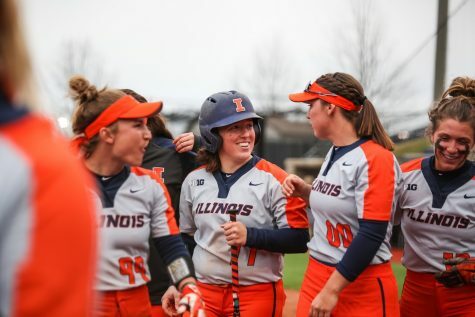 Although Illinois wasn’t pleased with the seven-run loss, the team quickly recovered to take an early lead of its own in the back half of the double-header. After leadoff hits from Thomas and senior Kiana Sherlund, senior Annie Fleming knocked in both runners on a single. Senior Veronica Ruelius drove in her own two runs with a home run off the scoreboard to give Illinois the early 4-0 lead. Indiana State managed to get a point on the board in the second inning with a home run and cut Illinois’ lead to 4-1. However, the Illini offense got back to work in the third inning, scoring another three runs. The Illini hit back-to-back shots in the third. Loya slammed a two-run homer followed by another scoreboard shot by Ruelius, earning her third home run of the year. Down 7-1, the Sycamores refused to quit. They hit the fifth home run of the game, the second from Indiana State, which knocked in two more runs cutting the lead to 7-3. 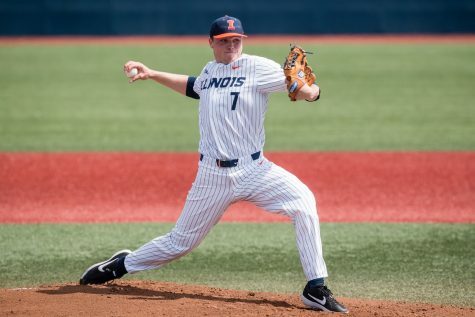 While Illinois remained scoreless the rest of the contest, Oestreich managed to hold the Sycamores to just one more run, clinching the 7-4 win for the Illini. Despite three errors by Illinois, the offense took hold of the game with ten hits compared to Indiana State’s eight. After a complete turnaround of results between the doubleheader, Ruelius believed the team was able to come back together and motivate each other to keep their energy high. 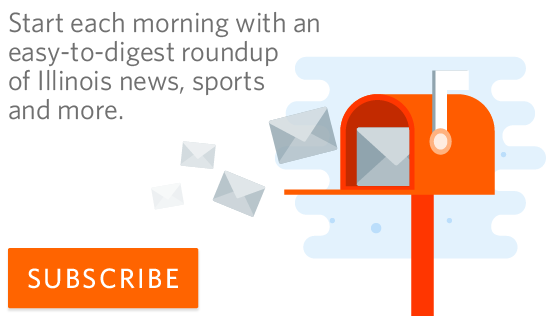 Illinois took a one-day break before opening up Big Ten play on Friday with a three-game series against No. 23 Wisconsin. The Illini defense struggled in the first game losing 15-6 before winning the series with a 2-0 shutout from Edwards on Saturday and a walk-off single in the bottom of the seventh to take the 6-5 Sunday victory. Wisconsin got off to an early start Friday afternoon, totaling three runs in the first inning off two RBI singles and an error. Unfortunately for the Illini, the Badgers never looked back. Illinois managed just one run through the first four innings, allowing Wisconsin to rack up a 6-1 lead by the bottom of the fifth inning. An error and a bases-loaded walk in the bottom of the fifth allotted for just two Illini runs. However, the Badgers recorded their best inning in the sixth, tallying six runs led by a grand slam from senior Stephanie Lombardo. The Badgers used an RBI double and an RBI single to grab the other two runs. 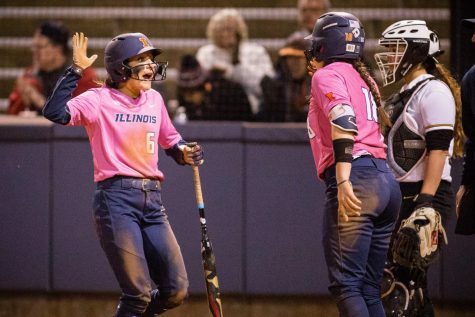 Illinois continued the fight by grabbing three runs in the bottom of the sixth, but ultimately fell 15-6 after Wisconsin scored another three in the seventh. 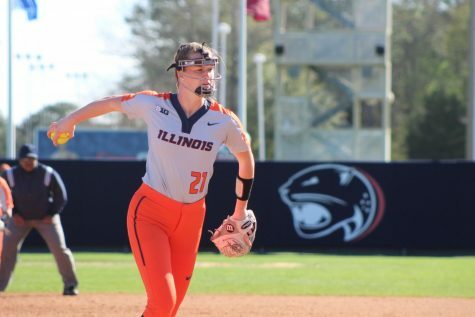 Although the Illini were disappointed in Friday’s outcome, they turned their attitudes around to tie the series on Saturday with the team’s first shutout of the year. 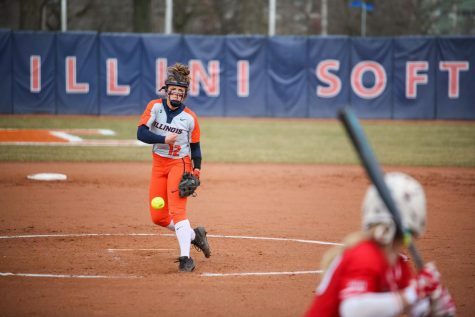 Edwards was the Illini’s saving grace Saturday as they continued to struggle at bat. In her second win of the season, Edwards completely shut down Wisconsin’s high-powered offense, and didn’t give up a single hit until the fourth inning. Despite winning, not much action came from Illinois’ offense as it tallied just seven hits compared to Wisconsin’s four. Both Illinois runs came from Wisconsin pitching errors. Thomas scored the first run for Illinois in the first inning off a wild pitch. Sherlund added the second run in the fourth inning after a bases-loaded walk. Perry believes the team came out on Saturday playing clean softball and focused on the basics to turn Friday’s loss into a win the following day. 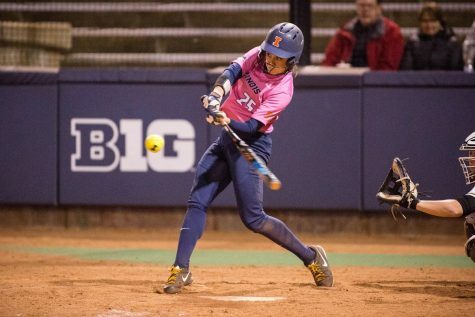 Although Illinois evened its Big Ten record, Perry was looking to fire up the Illini’s bats Sunday. After a two-hour rain delay, Illinois did just that. Fighting from behind since the second inning, the Illini kept their energy high and rallied in the seventh to score three runs. Freshman Kailee Powells broke the tie with a walk-off single. Wisconsin started the action in the second inning with a single home run, but Illinois quickly returned the favor with a home run from Ruelius who tallied her third homer of the week. The Badgers kept rolling scoring two runs in the third inning off two singles. The Illini followed up with an RBI from Loya to close the Badger’s 3-2 lead. After one-run outings in the fifth and sixth inning from Wisconsin and single run from Illinois on a wild pitch in the fifth, the Badgers entered the seventh with a 5-3 lead. Sickels, stepping onto the mound in the sixth, earned the win after allowing no hits and no further scoring in the seventh inning. With just one out to spare, Illinois’ offense came in clutch starting with singles from Sherlund and Fleming. Loya followed with an RBI double, sending in Sherlund. Fleming ran home on a wild pitch a few minutes later to tie the score. Powells came up to bat after and hit the first pitch thrown to her. She singled to right center and sent in freshman pinch-runner Zaria Dunlap for the game-winning run. 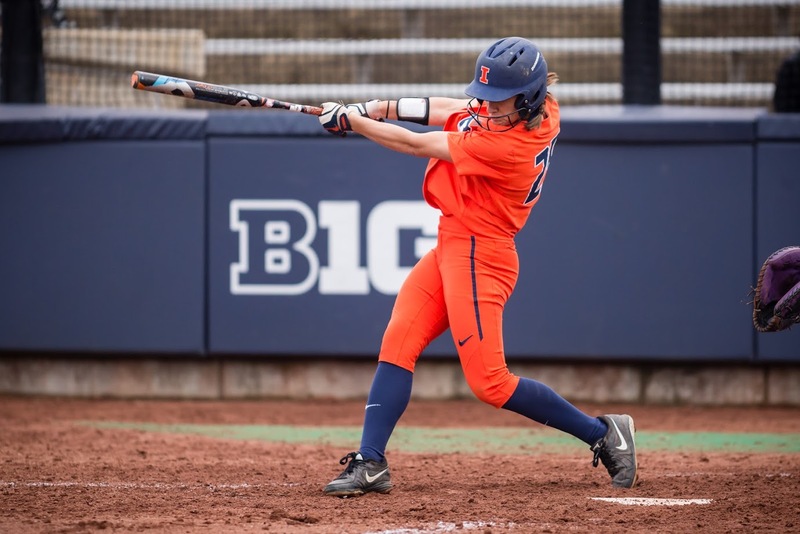 Following their first Big Ten series win of the season, the Illini will close out their homestand with a non-conference matchup against the Eastern Illinois Panthers on Tuesday at 5 p.m.